Co-parenting through summer can challenging and you might well be looking forward to getting back to your normal parenting time schedule. But for kids, going back to school can be an overwhelming time. Around about now is when children start worrying about which teacher they'll have; if their friends will be in their class and what the next Grade has in store for them. For children living between homes, they can also feel anxious about upcoming changes to the parenting time schedule. Take some time to talk to your kids about how they're feeling and help them to focus on the positive aspects of going back to school. With some planning and discussion, you can find the right strategies for your children. Now is a great time to plan an event to celebrate the end of summer. Whether you host a backyard party, go to a drive-in movie or take one last weekend camping trip – the theme of the event should be to celebrate what a wonderful summer your family has had. This is a great opportunity to talk to your kids and reflect on all the fun times you've had this summer. Summer is such a special time and forms some of our most favourite childhood memories. At the end of the event, talking about how things will change with the new school year is a great way to get them ready for the change into their school year daily routine. Organizing a big playdate at the local park with school friends can be another way to get kids excited about being with their friends again. Having a reminder of all the fun things that happen at school can also help get children excited for September. Keeping your kids informed about their schedule and planned activities can help them feel like they have some control in their lives. This is especially important for children moving between two homes. Sit down with your children and talk about what the parenting schedule looks like for the coming season. This is also a great opportunity to plan extra curricular activities with your children. Give them some choices so that they feel empowered. Be sure to speak to your co-parent in advance so that you are both in agreement about what is possible and what you will both accept so that your child isn't put in the middle. Summer is often a time when children living between homes get to spend longer periods of time with each parent. The great thing about this is that it strengthens bonds. But this can make it harder for kids to adjust back to the normal schedule and they may show some resistance. Sometimes being a great parent is about being prepared for the worst. When our children act out, they often do not let us know the exact angst they are acting out. A lot of the time they don't even know what is truly bothering them. Be prepared during the last two weeks before school starts for signs of depression, aggression or acting out. Understand that it is a sign that your child may have misgivings about the significant changes about to happen to their scheduling and have the foresight to start preparing for it ahead of time. Getting your children involved in the process mentioned above is a start, but also starting the process slowly can also help. Agree a plan with your co-parent about getting the kids ready to go back to school. It's important to ensure consistency between both homes. Try to roll back bedtime by 10-15 minutes per night and get them used to getting up in the mornings. This way, when school time comes they are not getting up 2 hours earlier than they are used to during the summer. To combat the blues, focus on the positives about their schedule that you know they will enjoy. Communicate often about school issues. Put your personal differences aside and put your children first. 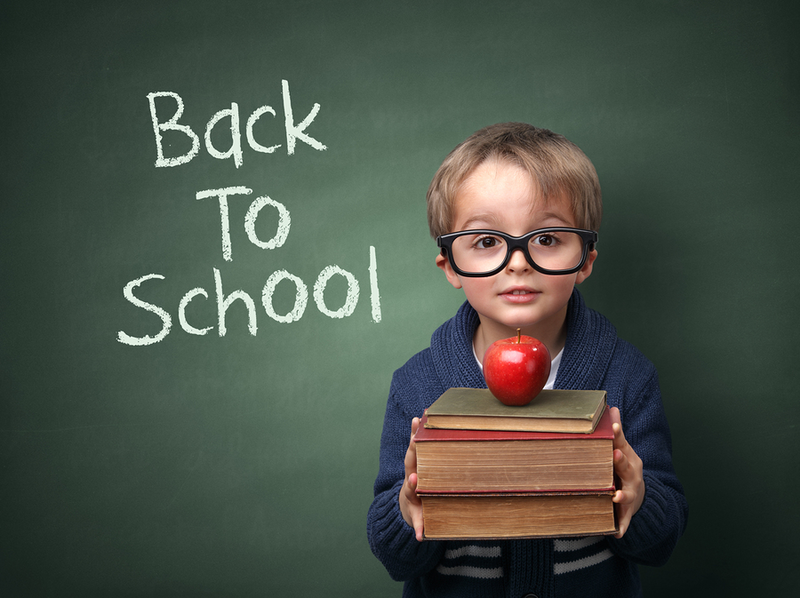 Focus on what needs to be communicated regarding your child's back-to-school events and needs. Communicate with your co-parent and agree to have a goal of coordinating ideas on a regular basis in order to help your child. Most co-parents will oblige when they realize it is in the best interests of their children. Consider meeting with the teacher together at the same time. It is difficult for teachers to help when there are opposing views regarding your child's needs at school. So it is a good idea to talk to each other first about what you think would help your child. Plan your schedules so that you can both attend Parent/Teacher orientations and meetings with teachers, especially at the beginning of the school year. Coordinate your schedules so that you can both attend school events and activities. With a little extra planning, you can find times that will work for both of you and help you both to be there for your children. Attend some school events together. Some divorced and separated parents prefer not to do this. They think people will wonder if they are getting back together or it might create jealousy for new significant others in your life. But just explain that you have to be there for your child and that is the most important thing. Ask your new significant other along to offer extra support sometimes. Offer support to your kids, even when you are away. Co-parenting back to school issues can cause psychological stress for both parents and children. It is important for both parents to be actively involved in back to school activities so that the child feels both are equally involved and supporting them. The most important goal is to be there for your children. This means coordination and communication when it comes to co-parenting back to school issues. Communicate with your co-parent on a regular basis and "agree to disagree". Put your differences aside and always act in the best interests of your children. Try your best to meet with teachers together and plan some times to attend school activities together as well. The key to success is being there for your children, together or alone, and putting your child's needs above your own. To recap, take some time to celebrate the fantastic summer you've had, involve your children in back-to-school planning and communicate with your co-parent. Maybe throw one last summer hurrah and prepare for back to school ahead of time.